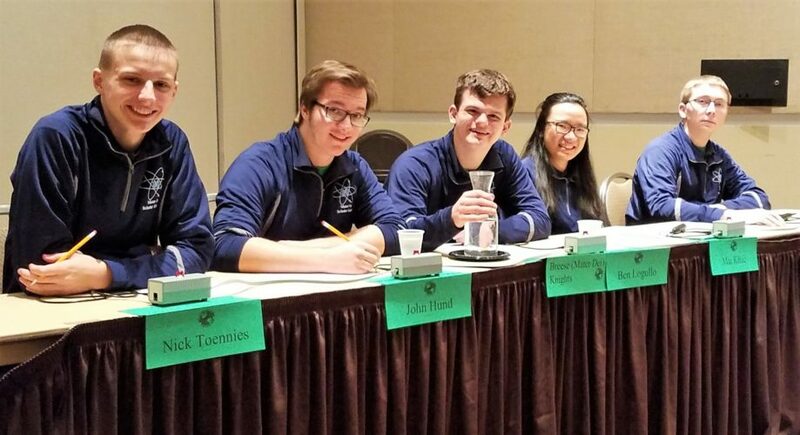 Scholar Knights Nick Toennies, John Hund, Ben Logullo, Mai Khuc, and Drew Potthast are pictured at the IHSA Class 2A State Tournament March 16. Ben Wilke, Anna Klostermann, and Valerie Hund also contributed on the day.Facing their toughest competition of the season, the Scholar Knights’ season ended at the IHSA Class 2A State Tournament March 16 with a record of 77-15. (A recap of the tournament matches is provided below.) Senior Ben Logullo was named to the IHSSBCA All-State Team, for which he will be honored at a banquet April 14. Join us in congratulating all Scholar Bowl members, as well as varsity coach Mr. Scott Timmermann, on their remarkable season! In addition to winning their IHSA Class 2A Regional and Sectional, the Scholar Knights advanced to the Illinois Masonic Academic Bowl State Finals and were the champions of the Illinois Masonic Academic Bowl Sectional, the Metro East Quad League Tournament, and the Clinton County Tournament. They also earned second place in the South Central Scholastic Conference.